If you’re looking for a delicious, super easy and extremely aromatic Greek dessert, look no further than portokalopita, also known as Greek orange phyllo cake. This portokalopita recipe is bonkers good! I guess I let myself get too excited with homespun cooking, delicious Greek mama food, feasts with family, fishing with friends and eating all these glorious meals; as a result, this blog post probably lost its way. Nevertheless, now that summer vacation is over, I had this idea of sharing one of my absolutely favorite Greek desserts. Portokalopita! 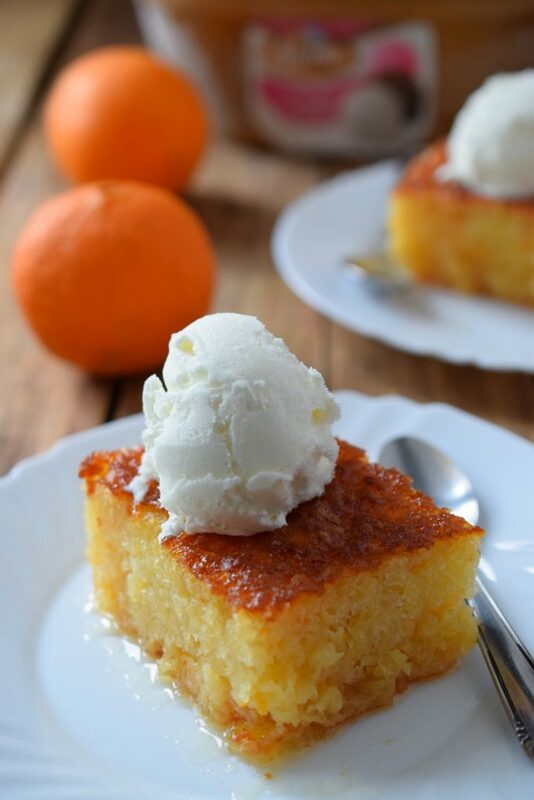 Portokalopita is a Greek orange phyllo cake and mega hit during the summer when you serve it with a scoop of ice cream. It’s crispy, syrupy, orange-y, and finger-licking good. Consequently, this portokalopita recipe has density you can’t beat. Deep-golden crust on top, custardy, with a thick texture this sweet citrusy concoction is bonkers good. Seriously, guys, you need to try this asap. I’ve also made a video about my portokalopita recipe. It’s currently in Greek but I’m working on subtitles right now. Check it out below! Last but not least, let me thank the lovely folks at Pappas Post for sharing this recipe the previous days. Greg, you are the best! Portokalopita, also known as Greek orange phyllo cake, is a delicious, super easy and extremely aromatic Greek dessert. Preheat the oven to 180oC / gas 4 / 350oF. Remove the phyllo sheets from package and shred into ½ inch pieces, using a knife or your hands. Grease a round baking dish or cake tin with sunflower oil. Combine the eggs with the sugar in a large bowl. Beat with a hand mixer until pale and frothy. Add the orange zest, Greek yogurt, vanilla extract and baking powder. Beat on medium speed until well combined. Slowly add the sunflower oil and beat again. Stir in the phyllo sheets gradually whisking each time with a spatula, until fully incorporated. Pour mixture into prepared dish and bake for 1 hour. In a saucepan, bring sugar, water, orange juice and cinnamon stick to a boil over medium heat, for 2 minutes; remove from heat. Pour the hot syrup over the cold portokalopita or vice versa. Set aside for 1 hour until the syrup has soaked in. Slice and serve. What do you think about my portokalopita recipe? Let me know your thoughts in the comments below! Thank you for your recipes !! What size tin for the Portokalopita ? Hello Maria! I used a 10 x 2.5 inch (25 x 6 cm) baking dish. You could use a round or rectangular one. Happy baking! How much is in ml 1 1/2 cup of water for the syrup? What size for round tin? thank you! Hi Valentina, it’s approximately 354 ml water. For this recipe, I would go with a 32 cm / 13 in round pan. It depends on how you add it to the batter. If you dry out the phyllo sheets, the portokalopita will be a bit more crunchy. I use them as they are for the sake of saving time, and the result is a rich, moist and dense portokalopita. It’s really up to your personal taste how to use the phyllo! Can I make this cake with less sugar? Hi Melina. I’ve been making this portokalopita for ages and I haven’t tried cutting down on any of the ingredients. However, I recently read a piece on reducing sugar in baking and it basically suggested cutting down about 10%-30% in recipes that do not require sugar for chemical reasons. It seems that you could decrease the quantity, but I’m not sure about the taste or actual baking success. Maybe you could try it and let us know how it went! This is one of my favorite recipes and I am auditioning recipes to arrive at The Perfect One. Do you use the “regular” thin phyllo or the thicker “country” sheets? Hi Karen. I’d go with regular phyllo sheets. 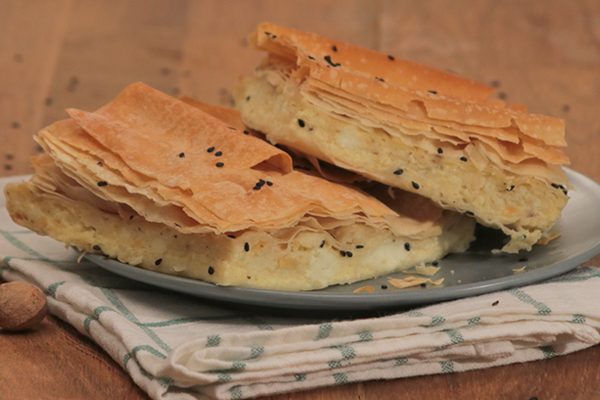 I’m not sure about the final result with thicker phyllo, but you could try it and let us know how it turned out! Made this yesterday using 0% fat Greek yogurt and it turned out great! Thank you! Thanks for the tip, much appreciated! Would it be possible to bake the cake and freeze, without the syrup? I would like to later thaw the cake and add the hot syrup. Any thoughts? Is it possible to freeze this cake? 1 1/2 cups of water seems too little for a syrup supposed to soak the baked cake…!? , do you have any idea what went wrong? 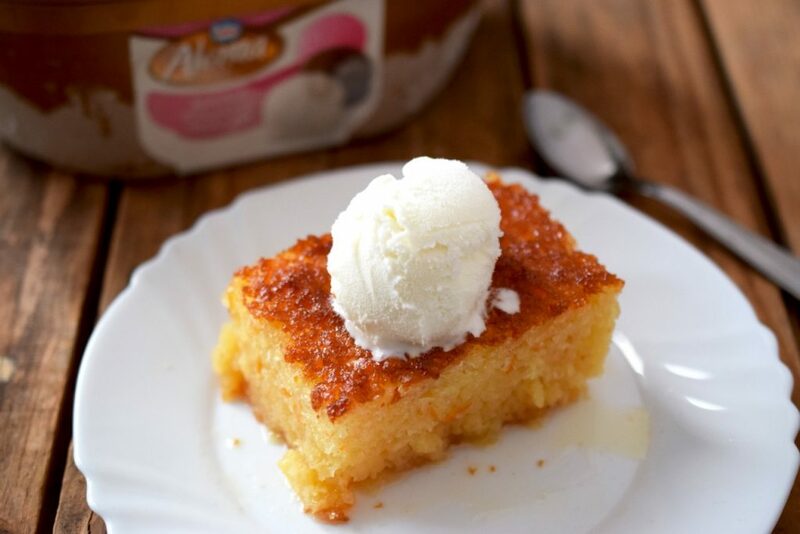 How can I recreate the airy texture I’ve tasted in Greece? Maybe drying the Philo? hi Dana, this is is a great idea. I also dry the phyllo sometimes when I feel like it! My package of phyllo is two individual packets totaling 16 oz. which the recipe calls for, but in the video it looks like you only use one. I am awaiting the outcome now. Hi Marsha! How did it go? Portokalopita is my favorite dessert. Can I make this in advance? For example.. the night before I am entertaining (for lunch the next day).. and would I store in the fridge or room temp? Sure thing! Store it in the fridge for 3-4 days and you’re all set! Made this cake today, beautiful just a little too sweet for me, do I reduce the amount of sugar in cake mix or syrup? Also what size cake tin do you recommend?